Brighton Cafe: Political Podcasts: A Growing Form of Political Journalism? 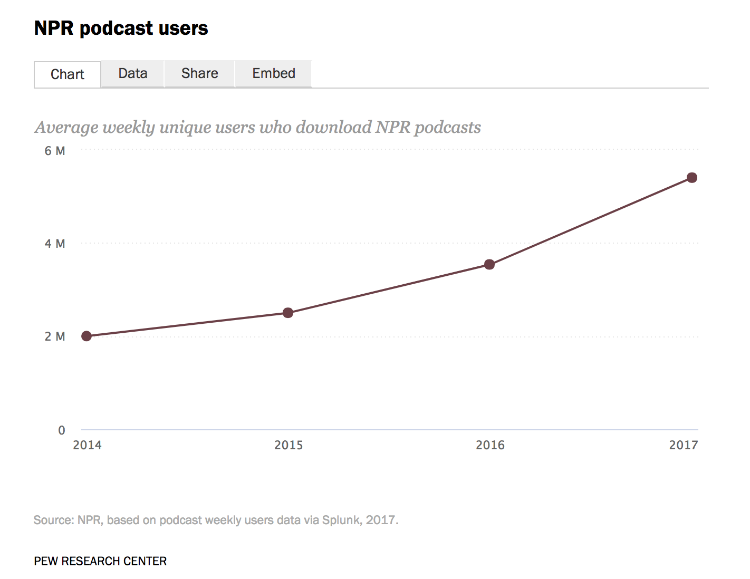 The turning point for podcasts and their popularity might have been Serial, which was downloaded over 77 million times within the first seven months. I have some thoughts on why people may be turning to political podcasts. Mainstream political news reporting is very much event driven, it is 24/7, it is politics as drama and entertainment, it is personality focused, has a sense of urgency and focused on what is happening right now. As Daniel Kahneman once said what is happening right now is not as important as you think it is. The problem with daily, even hourly, event driven reporting is not seeing the wood for the trees. Most political podcasts are not driven by 24 hour reporting, many are weekly or less frequent. As a result they tend to be less event and drama driven. My experience of political podcasts is that they are more reflective. They try to understand the context and what is happening. Often they interview various experts in depth, up to an hour, to seek to understand the issues. There is also something very intimate about podcasts. It is like you are sitting in on a conversation. There is less distance from say a written piece where the author has had time to construct what they are going to say. Podcasts tend to be quite informal, so you get a better sense of the person speaking and nuances in tone. The NPR Politics Podcast says it is where our political reporters talk to you like they talk to each other. People also spend a lot of time with podcasts and get to know the speakers quite well or at least feel they do. Podcasts are increasingly produced by the mainstream media such as BBC podcasts, the Financial Times and Guardian weekly politics podcasts and many more. In podcasts these publishers and broadcasters often take a different editorial stance and critique their own news. I wonder if these elements might lead people to trust podcasts more than other forms of media. Many political podcasters are becoming celebrities in their own right, such as Ed Miliband with his Reasons to be Cheerful podcast. Podcasts are often taken on the road and recorded in front of live audiences. Presenters from podcasts such as the Spectator's Coffee House Shots and the New Statesman, such as Katy Balls, Stephen Bush and Helen Lewis are also now regulars on the BBC and shows such as Newsnight. Podcasts do appear to be a new form of political journalism and I will try to document the different podcast typologies in a future post. I still suspect that listeners to political podcasts are a niche audience though increasingly there are more adverts on the podcasts, so some advertisers clearly see the audience as valuable. Part of my MSc research next year will be focused on this question. I will do a research survey around this topic next year but in the interim I would love to know what podcasts you listen to and why.